Nars – Yo, Porsche, what news? Por – The news is old. Mom still badgers me to get encaged. Nars – You’re, like, right. That’s not news. She’s been harpying on this topic for just forever. Por - She says she wants me to nettle down. Nars – Nettle down? A thorny problem. Por – She fears I’m too thorny. She says she’s afraid, with all my running around, I won’t remain chased until she gets a Grime and Brood, with me the half of it. Nars – All moms want their daughters to be Pure-White Bribes. It’s a Mom hormone thing. But you look more tweaked about it than usual. Por – She’s turning up the heat. If I’m not living in welded bliss by my twenty-first birthday, she’s throwing me out of the house. Nars – Ah, es una lágrima. Oops, I slipped in the Spanish again. My language teacher would be so proud. I meant to say, it’s a sham. Por – (aside) She conceives herself to be fluid in Spanish and is seeking compliments. Nars – Well, if you’re still a single girl by your birthday, and your Mom throws you out for it, you can come live with me. Por - --- and taking my car. Nars – Buy a new one. Your father left you plenty of money. Por - --- and closing my bank account. 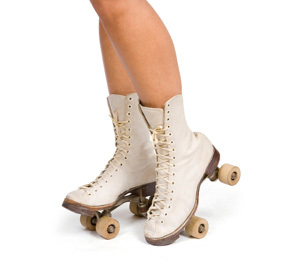 Por – And now she’s gone too far (stamps her skates in anger). She said she’s found me a financé. Nars – ‘Found’ you one? What, is she an explorer? Por – More like an exploder. She’s blowing up my life because I haven’t got a serious suitor to become, soon, my dustband. Nars – She can’t be serious herself! You have dozens of joyfriends. You’re the most popular whirl on the beach. Por – She doesn’t want me to have joyfriends. She wants me to have a permanent bitter half. But she’s afraid, with all the partying we do, that I won’t remain celebrate. Nars – How come she’s so interested in the personal status of your Verifiability? Por – She says that, unless I’m still – what she calls ‘a woman with Quality’ – and also web-locked by my twenty-first, I’ll lose the inheritance Daddy left me in his will. Nars – Well, you’re still, like, intact, aren’t you? Por – (nods in affirmation) Still a Version. But I’m also almost twenty-one, so she picked someone, and wants to get me buried to him, pronto. Nars – Did you know ‘pronto’ is a Spanish word, chicle mia? So who is this mysterious sueter who would slip in as your financé? Por – Not so mysterious. You know the donut shop on Miramar? Nars – Fat City. I know it and try to avoid it, to keep their buns from reaching mine. Sometimes I give in. Por- You know the guy from the shop who drives the delivery truck? Nars – Bastiano (laughs). The Wimp of Questionable Birth. Por – No question. He had a mother and she had a seaman. What they lacked was a legal pairage. Nars – Do you, like, like him? Por – I’ve never spoken to him. He’s just --- you know, there. Like the tables. But Mom’s trying to do this harangued marriage thing, which is SO medieval. Por – He goes to the church. A member of her conflagration. Oh, Narsissa, I’m not interested in this ‘awfully wedded’ trip. I’m afraid it’ll be a continuation of this whole superficial existence. Nars – (with arms outstretched, taking in the beach scene) You call THIS superficial? (Four boys in variously colored and styled hair skate past, whistling at Narsissa and calling her by name). (Narsissa shudders and says, aside) Whoa! I need more scum screen. Por – (almost whimpering) Help. who will lure you toward encagement, find one. But do this: choose one she is sure to hate. Maybe then, she will fish not with this melancholy bait.